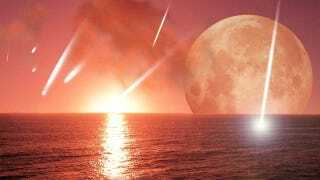 Scientists aren't exactly sure how life arose on primordial Earth, leading some to suggest that meteorites may have been responsible for delivering the key components required to spark and sustain life, like crucial minerals or dormant microbial life. Now, chemists from the U.K. are saying that meteorites may very well have played a role in the process, but by producing a life-giving chemical power source. Did "DNA tool kits" from meteorites make life on Earth possible? In the new paper, British chemist Terry Kee has proposed that a "chemical battery" was created by the meteorites when they delivered hot phosphorus minerals into hot, acidic pools of liquids around volcanoes. The resultant power sources would have been similar to the ones currently found in all living cells, which are important for generating the energy required to keep something alive. Specifically, Kee says it would have been a pyrophosphite molecule that contained phosphorus, oxygen, and hydrogen. To see whether pyrophosphite could have formed when meteorites landed on early Earth, Kee's team studied a Siberian meteorite that contained a lot of phosphorus. They incubated fragments of the meteorite in acidic water collected from volcanic ponds in Iceland, thought to be chemically similar to the water on primordial Earth. After four days in the water, the meteorite samples had released large quantities of phosphite. When this was dried out, it transformed into pyrophosphite. "We have shown that it's very easy to form," Kee says. His idea is bolstered by the discovery in 2009 that geothermal pools in California contain lots of phosphite. These pools resemble the primordial environment, suggesting that early Earth was also rich in the material. By reacting with the acidic fluid around volcanoes, the resulting mixture of phosphorus could have formed a kind of precursor compound that eventually led to chemical life. "Chemical life would have been the intermediary step between inorganic rock and the very first living biological cell," noted Kee through a statement. "You could think of chemical life as a machine — a robot, for example, is capable of moving and reacting to surroundings, but it is not alive. With the aid of these primitive batteries, chemicals became organised in such a way as to be capable of more complex behaviour and would have eventually developed into the living biological structures we see today." Read the entire paper at Geochimica et Cosmochimica Acta.